Trapeze bars are currently considered a playground hazard. Being aware of common playground hazards helps to make sure that your child is safe and has fun on the playground. The Consumer Product Safety Commission (CPSC) notes that each year more than 200,000 children visit the emergency room because they've been hurt due to playground hazards. Playground injuries are prevalent. Simply because a playground looks safe, or your kids have played there before, does not mean that there aren't hazards you should look out for. There are many kinds of playground hazards. Some hazards relate to equipment, some to environment, and some, sadly to a lack of child supervision. Following are the most common playground hazards identified by The National Playground Safety Institute (NPSI). Sometimes this list is called the "Dirty Dozen" because these hazards are so common. Improper playground surface: Rocks, grass, gravel, cement, brick, and stone, are all highly inappropriate playground ground surface covers. None of these surfaces helps protect a child's skin or limbs if they fall, and many make a fall worse. Rubber and wood chips do make nice soft ground covers. No falling zone in place: A fall zone means a decent amount of space is located under and surrounding play equipment. If there's not a fall zone around equipment of at least six feet on all sides, then that is a playground hazard. The fall zone should have proper ground covering as well. Choking and entanglement hazards: If there is a piece of equipment that can snag a child's hair or coat, thus tangling and or choking them, it's a huge hazard. All edges of playground equipment should be non-snagging, non-sharp, and have rounded corners. Broken or missing rails: On an open platform it's far too easy for a child to fall off and get seriously hurt if proper railing is missing. Railing should also be able to support heavier children, or it can break and become a hazard. Overcrowding of equipment: Playground equipment placed very close together creates congestion. Another hazard of this is that if a child falls, they could fall on another piece of equipment, which is worse than falling on proper ground covering. All equipment must be a proper distance apart - at least six feet, which covers the fall zone, but further apart is better. Trip hazards: Sadly a small trip can be just as harmful as a high fall. Cracked sidewalks, concrete, wood, ripped groundcovers, and broken pieces of equipment can all become trip hazards. Too large head spaces: If bars are placed too far apart, say on a railing, then a child's head can become caught and stuck. A child can choke to death if trapped like this. Sharp, rough, or pinching edges: Any surface that is not smooth, free of hard sharp edges, splinters, and breaks can be a cutting hazard. When a child runs into an unsafe edge of equipment they can suffer harsh injuries. Splinters can also appear in metal and plastic, not just wood. So far as pinching goes, a child might stick their hand under a see-saw, or in a gate that can close; both are the types of things that can pinch. Young kids playing on older kid equipment: A child who is three years old lacks the coordination of a ten year old. The equipment needed for younger kids vs. older kids can vary a lot. 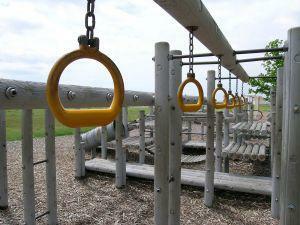 Be sure that if different age groups use a playground that there are separate areas to play in. Shoddy maintenance: A lack of quality maintenance is a major playground hazard. Each year (or seasonally to be safer) a full playground safety checklist should be gone over at your playground. Banned equipment: There is some playground equipment that has been deemed a hazard in recent years, but that doesn't mean it's all been removed from each playground. Some unsafe equipment to watch for includes; heavy swings, like the large plastic or metal-like animal swings, climbing ropes, swinging rings, trapeze bars, and monkey bars. The last dangerous playground hazard has to do with caretakers. Even on the safest of playgrounds accidents happen. Often accidents happen because of a direct lack of adult supervision. Children don't always know which equipment is age appropriate. As the adult, it's your job to always be aware of what the children you care for are doing. Be sure that your community and schools participates in National Playground Safety Week. You may also be interested in reading, Facts on Playground Safety, in order to plan events for safety week. The US Consumer Safety Commission has a full page of Playground Safety Publications available for parents and teachers. These publications can help to keep your children safe from playground hazards, and are well worth a look.